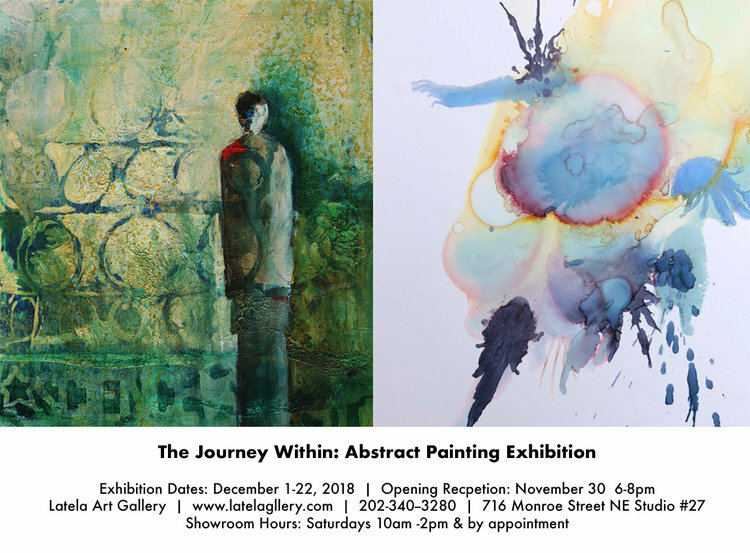 (Washington DC) Latela Art Gallery is proud to host The Journey Within, an exhibition that explores the abstract expressionism of eight local artists. This exhibition is meant to be an experience where the audience may interact with artworks that present a variety of emotions from the artists’ personal lives, psychedelic journeys, dreams, and fears. Each artist represents a singular style through the choice and application of their chosen medium. This exhibition explores a centralized theme of self-analysis within the artists and their paintings. The Journey Withinis curated by Willa Alexander-Jaffe, a junior at The George Washington University and 2018 Curatorial Assistant Apprentice at the Latela Art Gallery. The inspiration for this exhibition stemmed from Willa’s personal experiences as a young adult; her time spent as a college student led her passion for art to grow, but simultaneously caused her to experience feelings of invisibility when surrounded by “competition”. Ultimately, this exhibition surveys the hardship and excitement associated with following one’s dream and therefore, also tapping into one’s intuition or inner compass. Featured artists: Elizabeth Camilletti, Dominique Fierro, Kay Fuller, Anne Hanger, Tamora Ilasat, Brian Johnson, Karen Van Allen, and Rachel Wishner. The Journey Within. December 1-22, 2018 at Latela Art Gallery (716 Monroe Street NE Studio #27 Washington DC 20017, 202-340-3280). A public reception will be held on November 30, 2018 6-8pm. Gallery hours are Saturday 10-2pm or strictly by appointment. The gallery is also open many times a week for creative & wellness events: www.latelagallery.com/calendar/.